Drone technology of farming has been around for decades. 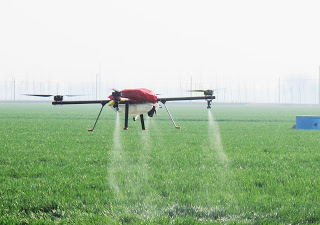 With the invention of newer, more effective agriculture technologies, drones have the benefits to launch the agricultural industry into a future of sustainability both sustainable farming and sustainable food systems. Collecting data using drones on the number of agricultural areas can capture highly accurate images of your fields. In addition to, drones for agriculture covers up to hundreds of hectares/acres in a single flight and increases farm crop yields while minimizing the cost of walking the fields or airplane fly-over filming. Data will be collected on the number of agricultural areas including greenhouses, farm buildings, irrigation wells, soil type and livestock breeding. Using a drone-enabled aerial mapping system is the ideal solution to generate high-resolution, highly-efficient aerial data, including topographic mapping, crop scouting, contouring, research climate changing, vector mapping and textured 3-D modeling. We hope through smart farming and sustainable agriculture with drone use being capable to create a highly-accurate agricultural database that supports decision making and forward planning — Using drones in agriculture is particularly important if we are to achieve outstanding outcomes in precision agriculture. Find potentially yield limiting problems in a timely fashion. This level of detail can help farmers increase production and efficiencies that lead to higher yields. One of the major benefits of drones in farming is ability to scout farm fields both quickly and efficiently. Rather than having growers evaluate fields manually on foot or by tractor, this technology allows farmers to gain immediate knowledge about the status of their fields in shorter periods of time. New drone technology is very effective at collecting data to help farmers improve crop health. Seeing the true health of your field in a color contrast allows you to see how much sunlight is being absorbed by the crop canopy. Drones flying over a field can collect plant height measurements by gathering range information from the plant canopy and the ground below. Thus most drones currently available for use in the agriculture industry are very costly. However, with new developments and further innovation, drones may start to prove their value in agriculture. 1 Response to "Benefits of Drones in Sustainable Agriculture and Sustainable Food Systems"